Bill 47, the Making Ontario Open for Business Act became the new reality for our workplace rights on January 1, 2019. This new legislation cancels the $15 minimum wage and takes away important protections such as paid sick days and equal pay for equal work. The government’s betrayal of working Ontarians is causing more and more people to join the fight for decent work. 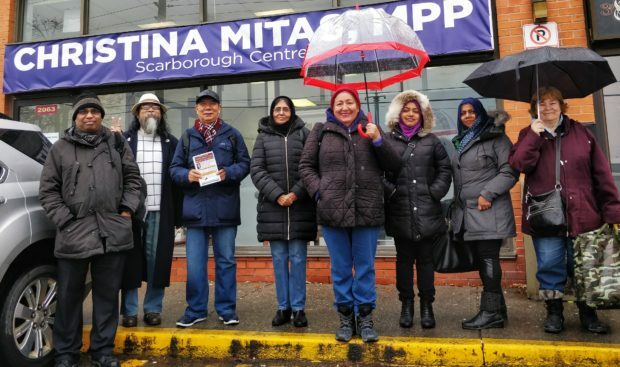 Our members and allies expressed their disappointment with MPPs who voted for Bill 47 by calling and visiting their constituency offices. Across the province, we are also letting community members know which MPPs played a part in taking away our rights at work so that they can be held accountable. The Workers’ Action Centre, along with our many allies in the Fight for $15 & Fairness, will continue to challenge precarious work, strengthen our labour rights and continue the fight for decent wages and working conditions. If you have a problem at work, call us at 416-531-0778 (or toll-free at 1-855-531-0778). All calls are free and confidential. Read and share information about your rights at work. We will be adding updated material in the coming weeks. By coming together to demand fair working conditions, workers have won major improvements in our rights. Together, we can win again. Thank you for standing with us to support workers’ rights.